Can't get fresh bamboo shoots? No worries, you can still find a wide variety of packaged bamboo shoots at Asian grocery stores. Some preserve the bamboo shoots in large chunks, usually quite pricey too, some in the form of cubes, threads, and slices. 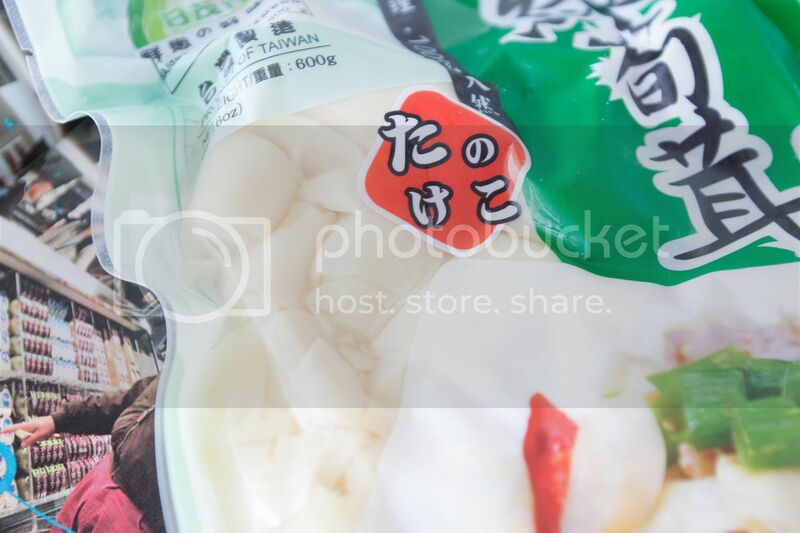 Some bamboo shoots are preserved in liquid, some dried, and even pickled. Let's not get into the story that I forgot to run the pickled bamboo shoots in hot water first before cooking last week. 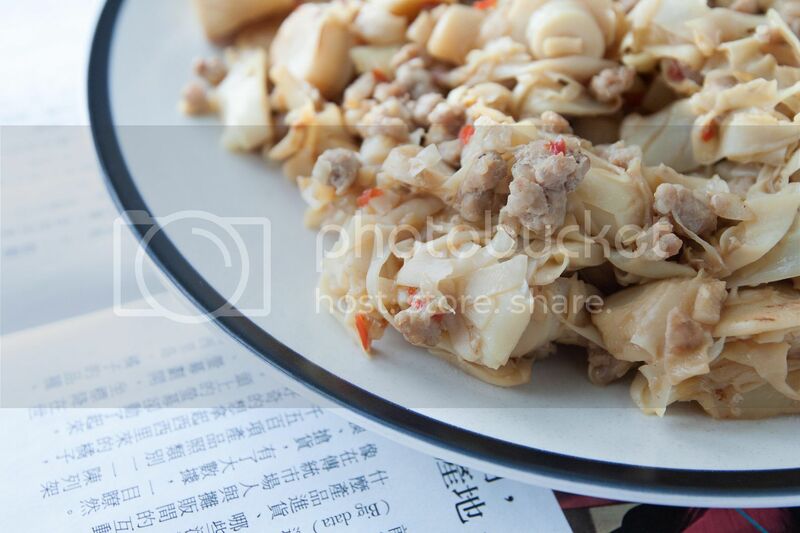 Poor Mr. at home, he had to finish very sourish bamboo shoots stir-fry meals after meals. Remember to cook the pickled bamboo shoots or soak them in water first to draw out excess sourish taste, lesson learned. 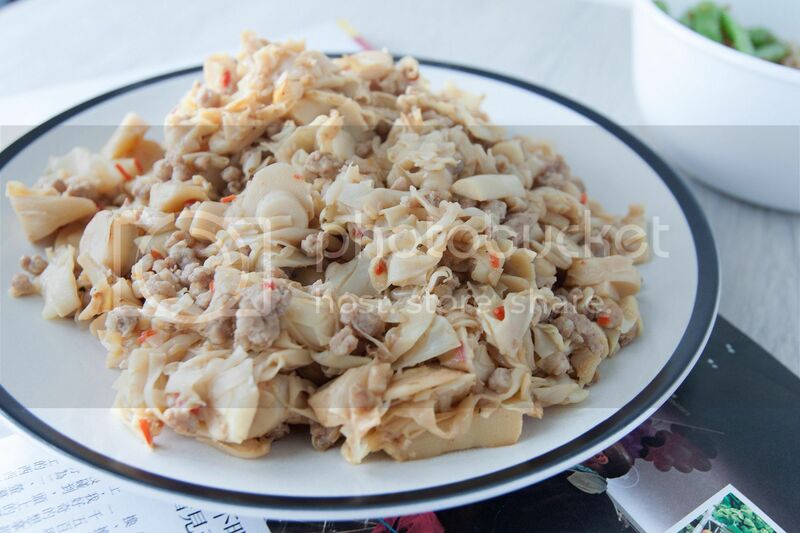 Luckily, this recipe calls for simple preserved bamboo shoots, the softer part of the shoots, with no acidity involved. No more accident, no more puckered face. Peel and finely chop the garlic cloves. Destem the chilies and finely chop the remaining section. If needed, drain out all the liquid from the preserved bamboo shoots and chop into smaller pieces. 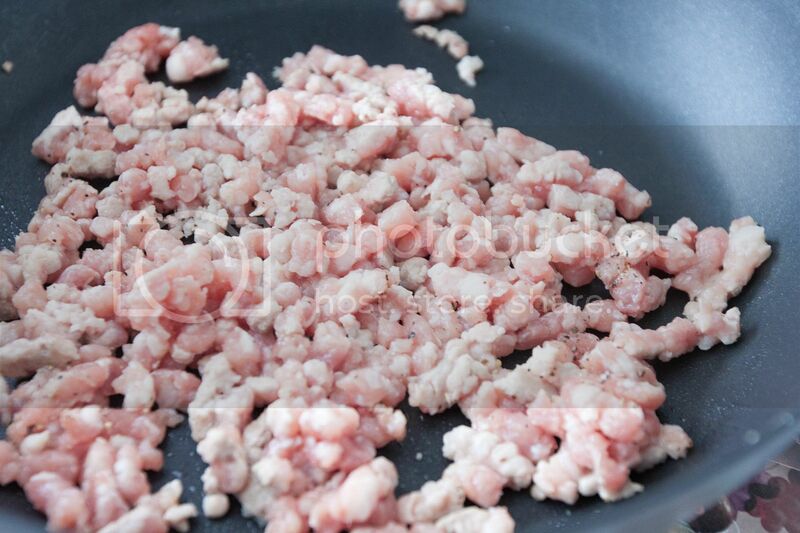 Take a pan and transfer the ground pork over along with salt and pepper. There is no need to add oil, just turn to medium heat and stir-fry the pork to gradually drawing out the pork fat. Once the pork turns slightly browned, push them on the side. Use the empty space, add in the garlic and chilies. Cook till aromatic but not burning the garlic. Turn to medium high heat. Add the soy sauce paste and soy sauce to the mixture and give everything a quick stir. Usually I would add a pinch of sugar too to balance of the saltiness, but the soy sauce paste used already tastes sweet, so the usual sugar has been omitted. Add in small pieces of bamboo shoots and mix together with all the ingredients and seasonings. Cook for about 30 seconds to 1 minute. Taste and adjust the flavors with salt if needed. Lastly, squeeze half of the lemon juice to brighten up the flavors. Sprinkle some white pepper powder and the dish is ready to serve. 1/2 of the lemon juice won't do any harm like my earlier sourish bamboo shoots accident. Mistakes still happen in my kitchen even after years of cooking, but that's part of the fun. I'm just glad that Mr. at home is willing to help me finish all the accidental creations.